During the holy month of Ramadhan, Muslims fast for one whole month. Every day from dawn to dusk, they abstain from eating any food, drink any liquid, smoke, nor engage in any sexual activity. During this month also they are expected to avoid impure thoughts and bad behavior. When it’s time to break the fast, at the sound of the call to Maghrib prayers, Muslims may start to drink or eat. In Indonesia this is called “Buka Puasa” or Opening of the Fast, known as Iftar. Usually people first take a hot or cold drink and eat sweet snacks to allow the tummy to slowly get adjusted to food again after an abstinence of over 12 hours, and take sweet drinks to supply energy. After this first light meal, they will go to prayers, and only after prayers will there be the proper evening meal. 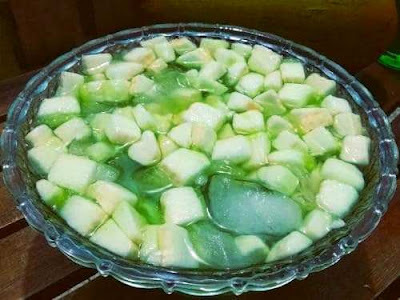 Kolak is a very popular opening dish during Ramadhan because of its super sweet taste, and is highly recommended to increase blood sugar level after long hours of fasting. 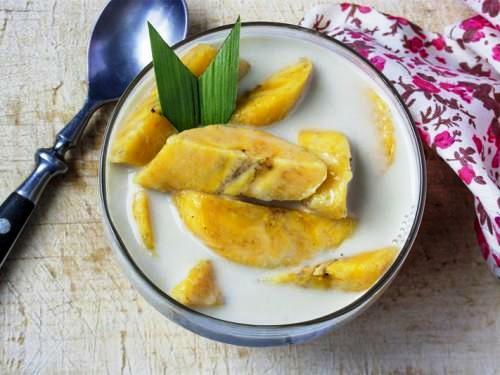 It is a brew of coconut milk, mixed with palm sugar, vanilla, pandanus leave, and filled with appealing slices of banana, sweet potatoes and optional pumpkins. During the fasting month you can find Kolak in most traditional food stores in Indonesia. It is usually also served for free in restaurants during Ramadhan. 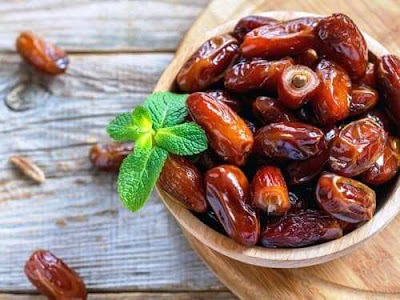 Dates are very easy to find in most supermarkets or traditional markets all over the country during Ramadhan. It is considered the best food for breaking the fast, as it tastes very sweet and is nutritious. Kurma (or dates) are known to provide benefits for health, among others to overcome anemia, keep teeth and bones strong, prevent stroke, as well as prevent coronary heart diseases. One of the many Ramadan special drinks is this one from Makassar in South Sulawesi. 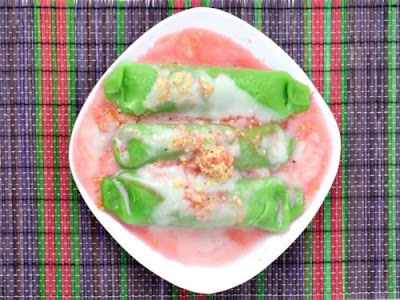 Pisang Ijo. literally meaning green bananas, is made from banana wrapped in flour dough, which has been colored green. It is served with coconut milk, cocopandan syrup and shaved ice to make this drink even more refreshing. You can also find it easily along Pantai Losari or Losari Beach in Makassar. In Bandung, West Java you can get the famous Es Pisang Ijo on Jl. Ternate and Jl. Dipati Ukur. While in Jakarta it is sold on Jl Pemuda, in Jakarta. 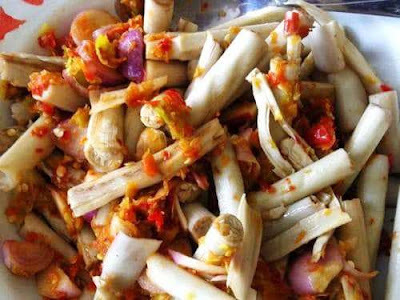 Kicak is one of the most typical food you can only find during Ramadhan and is unique to Yogyakarta. 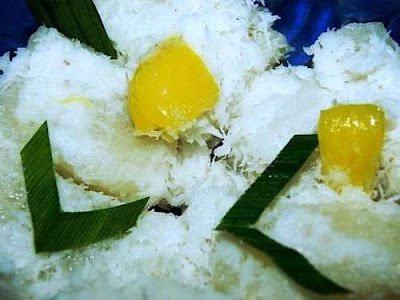 It is made from mashed sticky rice, mixed with grated coconut and sliced jackfruit bulb as a complement. The sweet taste and aroma of jackfruit will whet your appetite, especially when it’s wrapped in banana leaf. You can find this snack at Kauman, Yogyakarta, where it originated. 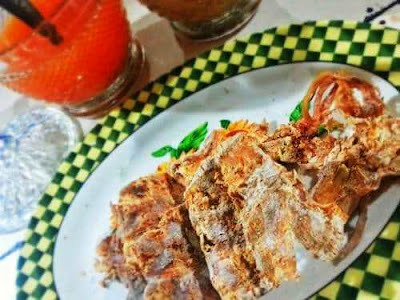 Pakat, is a very popular dish during Ramadhan in Medan, North Sumatra. It is made from rattan. You read that correctly. Rattan — the climbing palm also used to make furniture. Young rattan is grilled for one hour then peeled before served. To complete the taste of this tender and warm rattan, they put fried grated coconut on top and add traditional chili sauce. You can enjoy a portion of pakat for around Rp 8,000 to Rp 10,000. People in West Kalimantan also have their own unique food that “appears” only during Ramadhan. They call it Sotong Pangkong. It is made from dried cuttlefish (sotong means cuttlefish), that is grilled over a charcoal fire. After grilling, it will get pounded or beaten to make it more tender and chewable. This savory sotong pangkong is served with two kinds of sauces: shrimp sauce and peanut sauce. If you happen to be in Pontianak during Ramadhan, this delicious, mouthwatering dish can be found along Jalan Merdeka. 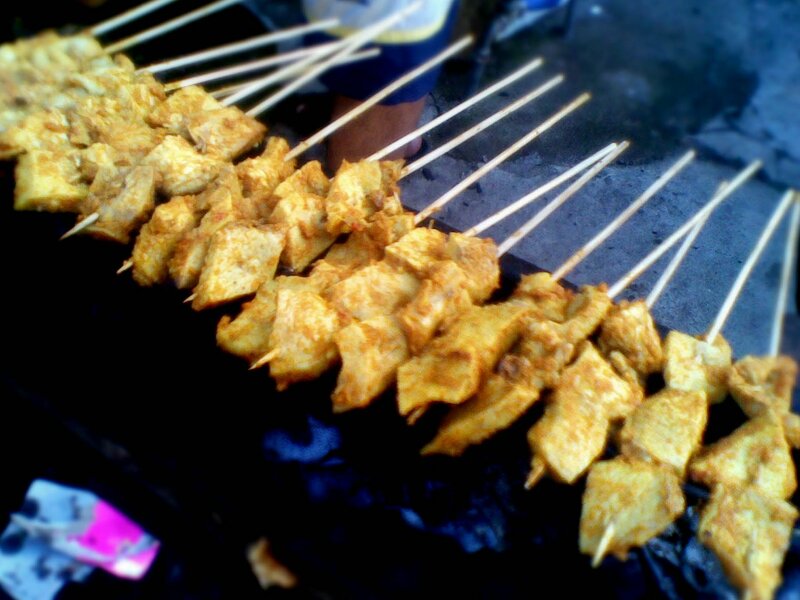 For Muslims in Bali, Sate Susu is a must-have meal for Buka Puasa. Made from cow udders, it is seasoned with traditional spices then grilled over charcoal. Sate susu is popular not only because of its delicious taste but also for its benefits to the human body: boosting stamina during fasting time. To enjoy a portion of sate susu you will have to pay around Rp 10,000 only. Come to Kampung Jawa in Denpasar if you are curious to taste some! Es Timun Suri is a phenomenal Ramadhan drink since most people mistakenly think that the fruit grows only during Ramadan. It is not entirely true, since the fruit can actually grow any time of the year, but farmers usually start planting before Ramadhan to meet the yearly demand. Timun Suri is shaped like a melon and contains lots of juice. It is usually served with cocopandan syrup or honey. In some parts of the country, people mix it with palm sugar syrup or condensed milk, then pour a little bit of lime juice for a sweet and sour fresh taste. Although it comes originally from Cirebon in West Java, today you can find this fruit sold along many streets in Jakarta during the fasting month.